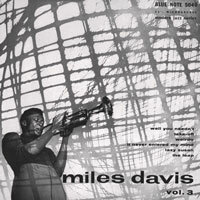 Recorded at Rudy Van Gelder's studio on March 6, 1954, this was the emerging trumpeter's third session recorded for Blue Note. Originally released on a 10" pressing (BLP-5040), Classic Records is proud to once again make this collectable available in this original format. With the assistance of EMI/Blue Note, Classic has been given access to recently-discovered original source materials on the Blue Note sessions and along with the upgraded sound, has painstakingly worked to deliver a high-quality 10" pressing and also faithfully reproduce the original 10" jacket. Original 1954 first-pressings in mint condition have been known to bring a minimum of $300.00 on the collector's market. The set features the leader Miles with some of his finest playing. His support includes Horace Silver on piano, Percy Heath on bass and Art Blakey behind the drums. The original six selections include "Take Off, Lazy Susan," "The Leap, Well You Needn't," "Weirdo and It Never Entered My Mind."